The current information about the effect of physical exercise on the body concentrations of several minerals is still limited, both in the acute (short-term) and adaptive (long-term) responses. 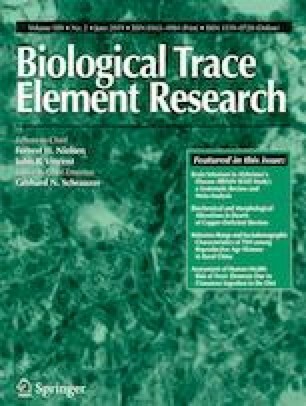 So, this manuscript aims, on the one hand, to assess the possible differences on basal levels of cobalt (Co), copper (Cu), and manganese (Mn) concentrations in serum and urine between athletes and sedentary participants and, on the other hand, to evaluate the effect of an acute progressive physical exercise until voluntary exhaustion on the serum and urinary concentrations of Co, Cu, and Mn. Two groups participated in this survey, one was formed by untrained, sedentary males (CG; n = 26), and the other group was constituted by national endurance (long and middle distances) athletes (AG; n = 21). All participants were from the same region of Spain. Participants of both groups performed a physical test on a treadmill, reaching voluntary exhaustion. Blood and urine samples of each participant were collected before and at after the tests. Once obtained and processed, the concentrations of Co, Cu, and Mn elements were analyzed by inductively coupled plasma mass spectrometry (ICP-MS). The differences in the studied variables were evaluated using a mixed model by means of an ANOVA and Bonferroni post hoc tests. In the comparison of the pre-test values between groups, the results showed that serum concentrations of Mn were significantly lower in CG than in AG (p < 0.01). In urine, Co and Mn levels were significantly higher among CG participants (p < 0.01) than among AG ones, while in the case of Cu, the values were lower (p < 0.01) in the CG than in the AG. Regarding the effects of the effort tests, no significant changes were found among the participants of the CG. It was observed that the serum concentrations of Co (p < 0.05) and Cu (p < 0.01) decreased after the test among the AG participants. Also, the results showed that there were no statistical differences in Co and Mn values (expressed in μg/g creatinine). However, the urinary post-test Cu concentrations were lower (p < 0.05) among AG participants. In basal conditions, serum concentrations of Mn were significantly lower in CG than in AG. In urine, Co and Mn levels were significantly higher among CG participants and Cu level was significantly lower in CG, a fact which may reflect adaptive responses to exercise. An incremental exercise to exhaustion in AG produces a decrease in Co and Cu serum concentrations, as well as in urinary excretion of Cu. This study received financial support provided by the European Regional Development Fund (ERDF) and the Government of Extremadura (project PRI08B130). This research was carried out under the Helsinki Declaration ethic guidelines, updated at the World Medical Assembly in Seoul in 2008, for research with human subjects. The experimental design was approved by the Ethic Committee of University of Extremadura.